Building on a recipe that I learned to make while working at the Coffee Loft in Fairhope many years back, this bisque recipe is tried and true and simple enough to make for even the beginner soup maker. All it takes is a little time, patience and love and the right combination of ingredients. 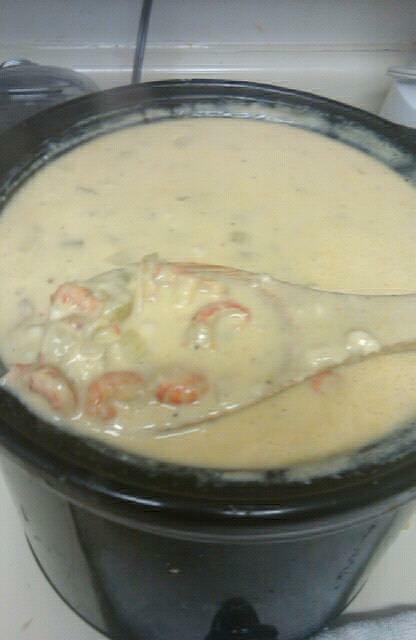 I have made this both with crab, crawfish, shrimp and corn, and with all 4 it’s fabulous! But if you have a picky eater like I do, you can skip the corn and just add the good stuff!! Start with a large pot with a tight fitting lid, preferably a dutch oven or gumbo pot. I have one that was my granma’s that has lots of good years of use already in it! I have also made this recipe recently in my crock pot, and it turned out really great! You’ll need 1-2 sticks of unsalted butter, softened, one large yellow onion, chopped fine, one large bunch of celery, finely chopped, and about 6-10 cloves of garlic, smashed and chopped. Also you will need all purpose flour to start your rue. Over med-low heat, begin melting the first stick of butter. By tablespoonfuls, add the flour to the butter, stirring vigorously each time and making sure not to burn the flour. You will add up to 1 cup by the time you are done. Add 1/2 of the remaining stick of butter at the end, and let the rue cook for a few mins to get the raw flour taste out, but again keep stirring it to make sure it doesn’t burn. After a few mins, the rue should be a light brown color, then you can start adding your veggies the holy trinity-the onions first, then celery, then garlic last. Mix this well. the veggies should be well coated in the rue mixture in almost a paste-like consistency. Let them cook for a few mins. After a few mins, you will need to start building your soup. First, add about 1 box (or 2 depending on how much you want to make) of low sodium chicken stock. Turn the mixture up to high and let it start to come to a boil. At this point, you may also add some chicken base- about 1 tsp. if you have that at home as well. Next, add 1 large container half and half. Let the mixture come to a rolling boil before you add the seafood. Jimmy really had no idea what a crawfish was until he moved down south! Now he’s hooked for life on that DIP (Sauphin Island Parkway) seafood! !I have used freshly peeled and caught crawfish, as well as frozen, but in Mobile you have the availability of both at your fingertips. Either will work well here. If you are using fresh, 2 lbs will do. If you are using frozen, 2 packs should work. Also I use 1 container lump fresh crabmeat (the pricey stuff) along with 2 cans of the inexpensive crabmeat you can find at most stores. If you are adding shrimp in this step, you would need to peel and devien them,a nd add them last. Add the crabmeat at this point along with 1-2 tsp zataran’s or other crab and shrimp boil, salt and pepper to taste, cayenne to taste Or you can use Emeril’s seasoning here, and garlic powder or Everglades seasoning to taste. Let that cook on a low boil for a while, or all day if you like, the longer the better, then add the crawfish last. Mix well all ingredients making sure the bottom isn’t burning, and return stove to med-low. Cover the mixture and let simmer for 30-40 minutes, stirring about every 10 mins. After the soup has thickened, you may add your shrimp at the very end along with green onions, corn, and parmesan cheese if you like. This soup will be better over time and the longer you let it sit and cook. It is also WONDERFUL the next day after soaking a bit in the fridge. I like to serve mine with crusty french bread and extra parmesan on top, along with a cold beer! This recipe also easily doubles and is great for ball games or parties!!! That one was for you Mitra!!! Let me know if my instructions weren’t clear 🙂 In a hurry to get home and cook now!